I read this book a couple of months ago with Doing Dewey‘s nonfiction book club, but luckily I took notes. This book documents the mass extinction that Kolbert (along with quite a few scientists) believes is due to humans. It’s not only about hunting animals out of existence. It’s about carrying invasive species (including animals, plants and fungus) into new environments. These species are destructive to foreign ecological systems because each system did not develop in parallel with the new species – thus the system did not develop immunity and protection against the invasive species. For instance, our travels around the world transport fungus that have caused plague among bats world-wide, and frogs in the Southern Americas. 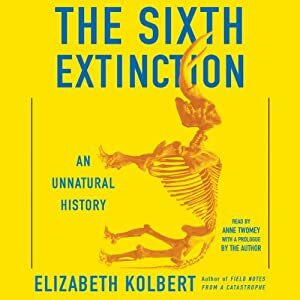 This book is mainly a scientific endeavor written by a journalist, but we also get to follow Kolbert as she shadows scientists around the world in their quests to study and prevent extinction. At first, this book made me feel guilty for the extinctions that humans have caused. But then I realized that we are a kind of invasive species too. Is it really our fault that we developed minds and then tools capable of carrying us around the world? Had we any idea of the destruction that we would cause? No. We were just doing what any species does – procreate, expand, and diversify. I also feel that Kolbert was catastrophizing a bit in her book. Although humans have certainly caused a lot of damage to our planet, I don’t think we are capable of destroying a world that has survived so many other massively destructive events. We are just another blip in the planet’s development.